It can definitely be overwhelming to visit a Spanish speaking country with dietary restrictions, especially when you don’t know the language. If you are vegan or vegetarian or have allergies and need help explaining them in Spanish, this article is for you. I am vegetarian and am almost fluent in Spanish. I live in Mexico City and haven’t had too many issues being a vegetarian here. That is mainly because I know how to request food without meat. Mexico, along with many Central and South American countries have a typically meat-heavy diet. I don’t have any experience with food in Spain or European countries so I can’t speak to that. Regardless of where you go, if you are traveling with non vegetarians or non vegans you’ll likely end up at a restaurant with few veggie options. That is totally okay. Here in Mexico it is super easy to make special requests for your food to be veg-friendly. Below are some phrases to use to ask about vegetarian options. Following these are ways to request that a specific dish be made slightly differently by eliminating meat and animal products. Absolutely delicious vegetarian enchiladas at Le Pan Quotidien in Mexico City. Are there any vegetarian/vegan options here? ¿Hay opciones vegetarianas/veganas aqui? Where are the vegetarian/vegan options on the menu? 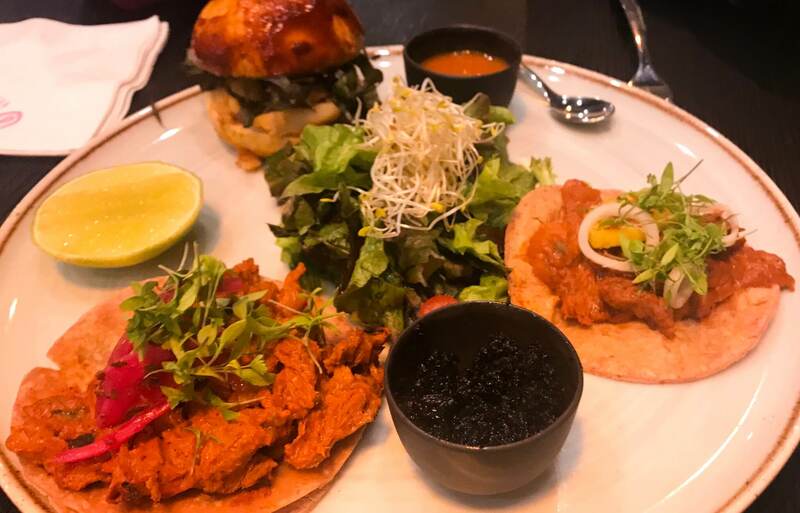 ¿Dondé son los opciones vegetarianas/veganas en el menu? What restuarants in this city have lots of vegetarian/vegan options? ¿Qué restaurantes en esta ciudad tienen muchas opciones vegetarianas/veganas? Does this meal contain meat? ¿Esta comida contiene carne? Does this meal contain animal products? ¿Esta comida contiene productos animales? I am vegetarian/vegan. Soy vegetariana/vegana. (Use vegetariano/vegano if you are male as Spanish is a very gendered language). Vegan Smash Bagel at Inside Cafe in San Miguel de Allende. Can I please have this dish without meat? ¿Puedo tener este plato sin carne, por favor? Can I please have this dish without fish? ¿Puedo tener este plato sin pescado, por favor? Can I please have this dish without dairy? ¿Puedo tener este plato sin lechería/lactosa, por favor? Can I please have this dish without eggs? ¿Puedo tener este plato sin huevos, por favor? Can I please have this dish without honey? ¿Puedo tener este plato sin miel, por favor? Drool worthy vegan enfrijoladas from La Pitahaya Vegana in Mexico City. If you have a severe allergy or intolerance, it’s important to alert staff at restaurants. You probably already know this, but oftentimes a menu will only list the principle ingredients of the dish and may leave other ingredients out. This is why you sometimes need to ask for clarification and make sure there’s no diary (or whatever you’re allergic to) in the dish, even if the menu doesn’t list it as an ingredient. I have lactose intolerance and while I can still eat goat cheese, I absolutely cannot have any type of cheese that comes from a cow. I also can’t have ice cream or milk unless it’s vegan. So I totally understand the fear you may have around making dietary requests in another language. Below are ways that you can say what you are allergic to and how to ask for meals without those foods. I have skipped how to ask for a meal without dairy, eggs and honey as those are listed above. Please keep in mind that I cannot guarantee that asking for your food in this way will prevent a restaurant from actually putting these foods in your dish. It sure can help but sometimes restaurant staff get things wrong. If you have a severe allergy, the best thing you can do is search for restuarants in the area that you’re visiting that don’t serve the allergen you’re avoiding. You can also email restaurants ahead of time to ask any questions you may have, or simply visit a grocery store and cook for yourself. Always bring allergy medications or an epi-pen if you use one, just in case. Mouth watering Vegetarian Vintage Bowl at Garabatos in Mexico City. I am allergic to peanuts. Soy alérgica/alérgico a los cacahuetes. I am allergic to tree nuts. Soy alérgica/alérgico a los nueces de arból. I am allergic to nuts. Soy alérgica/alérgico a los nueces. I am allergic to dairy. Soy alérgica/alérgico a lechería. I am allergic to eggs. Soy alérgica/alérgico a los heuvos. I am allergic to soy. Soy alérgica/alérgico a soy. I am allergic to wheat. Soy alérgica/alérgico a trigo. I am allergic to fish. Soy alérgica/alérgico al pescado. I am allergic to shellfish. Soy alérgica/alérgico a los mariscos. I am lactose intolerant. Soy intolerante a la lactosa. I have Celiacs Disease. Tengo Enfermedad Celiaca. Tasty, vegetarian, chilaquiles rojos from Garabatos in Mexico City. Can I please have this dish without peanuts/tree nuts/nuts? ¿Puedo tener este plato sin cacahuetes/nueces de arból/nueces por favor? Can I please have this dish without soy? ¿Puedo tener este plato sin soy por favor? Can I please have this dish without wheat? ¿Puedo tener este plato sin trigo por favor? Can I please have this dish without shellfish? ¿Puedo tener este plato sin mariscos por favor? The best guacamole I’ve ever had from Forever Vegano in Mexico City. There are a few other things you may want to know before eating at restuarants in Spanish speaking countries. Some of these words may be more specific to Mexico, as that is where I live, but they should be understood in most other Spanish speaking countries. The phrases below include how to ask for the bill, saying something is delicious and more. For more general Spanish speaking tips and even how to use Mexican slang, you can read this article. Could we get the bill please? ¿Podemos tener la cuenta por favor? The food was delicious, thank you. La comida fue deliciosa, gracias OR La comida fue muy rico, gracias. Please add a 15% tip. Por favor, agregue un propina de quince por ciento. Please add a 20% tip. Por favor, agregue un propina de veinte por ciento. Please add a 25% tip. Por favor, agregue un propina de veinte cinco por ciento. Hiya, This is a fantastic recipe, thank you for taking the time to write the article. I am a good food lover and I like making milk tart.